Let's face it: our surroundings shape the way we interact with each other, whether it is at home, in a coffee shop or at medical practice. The way you interact with patients and colleagues can be subtly influenced by the design of your workspace. And even if you didn't get to design it from the ground up, there are subtle ways you can change things to make a difference. Technology, industry pressure, and even the widespread use of hospitalists has deeply impacted physician relationships with each other. Recovering collaborative professional collegiality will be a huge key to the reduction of physician burnout. While the phrase "disruptive physicians" can easily be thrown around or weaponized against doctors who simply want to see real change happen, there are times when doctors are actually affecting patient care and safety and team morale. Treating them fairly is a leadership skill that hospital and group practice employers need to get under their belt. The prevailing ethos of putting the Triple Aim first at all costs - resulting in inordinate amounts of work is put on the backs of clinicians - simply cannot be maintained. But under the Hippocratic Oath, a lot of physicians feel compelled to comply in the "best interests of the patient". Is there another way? Have you considered the recently modified Geneva Oath and creating a culture where self-care is the expected norm of professionalism? In 1999, the author of the Maslach Burnout Inventory and an organizational specialist, wrote a groundbreaking book helping employers understand the systems level causes of employee burnout, why they should do something about it, and how to intervene. Below is an overview of the six areas of worklife survey and contrasted with the MBI. Evidence shows that doctors nationwide are reluctant to seek help because of questions on the Board of Medicine's licensing application. In 2009, a study showed that up to 69% of state board applications included "likely impermissable" or "impermissable" items based on current Americans with Disabilities Act and case law. In Idaho, we have been successful in helping prod our state board along to eliminate application questions around mental health that delve further than current impairment. Additionally, if a physician is is current successful treatment for mental health concerns, this does not need to be reported on the new or renewal application. Fortunately, the Federation of State Boards of Medicine is moving on this issue and making recommendations to state members. Here's the North Carolina story of how they were successful in addressing this issue. In 2017, Dr. Tait Shanafelt, MD left Mayo Clinic and took the first known academic medical center Chief Wellness Officer role at Stanford Medicine. (Although, Barbara Hernandez should get some credit for playing a similar wellness role at Loma Linda University for many years, albeit not a physician and not a C-Suite leader.) Since it was Dr. Shanafelt's 2014 Mayo Clinic Proceedings report on burnout that set the national medical community on fire about the topic, everybody looked to this move as a significant move and suddenly hospitals began investigating some sort of bird-dog role for wellness at their institutions. But is this just another attempt at a one-shot panacea that hospitals and executives can point to and say, "We've addressed burnout. Now back to the salt mines?" Dr. Paul DeChant is a family physician, former CEO of Sutter Gould Health Foundation, and Deputy Chief Health Officer at Simpler Consulting, an IBM Watson Health company. He spends a lot of effort talking to C-Suite leaders about physician burnout and what their leadership can do to combat it through organizational efforts. According to DeChant, "A key to the role is having an effective way to impact and improve the clinical workplace, not simply support the worker. Therefore, reporting responsibility should be to the CEO, and decision authority should be on par with the COO, CFO, CMO, and CNO. In that way they can work as a team to address workplace dysfunction." By the way, if you're thinking of creating a CWO role in your organization, consider anteing up $10K to go to Stanford's WellMD training they've started. It's a tidy sum, but if it prepares you to succeed at this new institutional challenge, you might end up saving your employer millions of dollars over the coming decade. 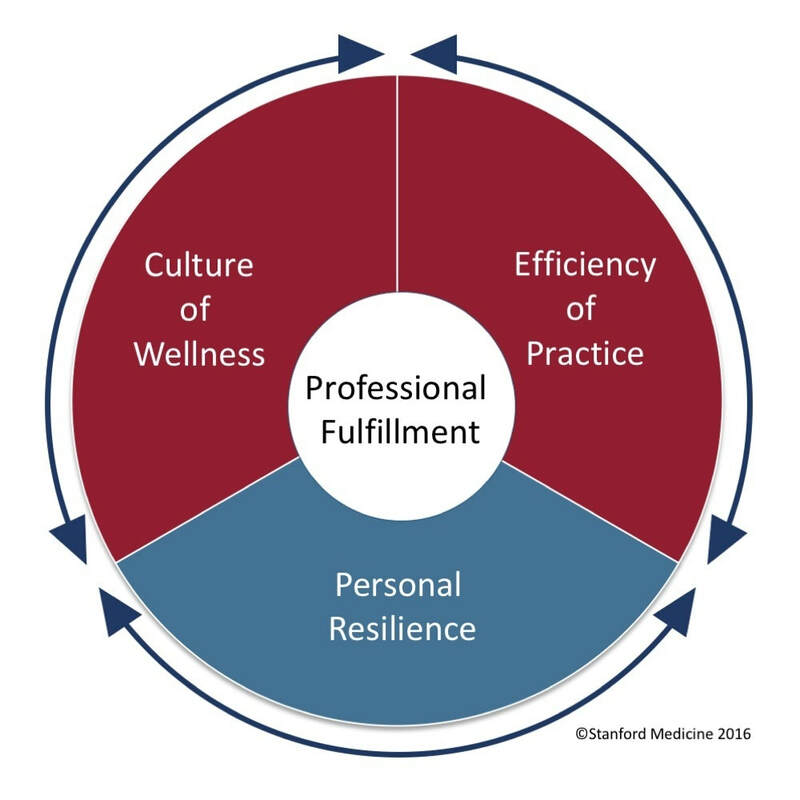 We love the three legged stool concept of Personal Resilience, Efficiency of Practice, and Culture of Wellness as a balanced approach to professional fulfillment of physicians. 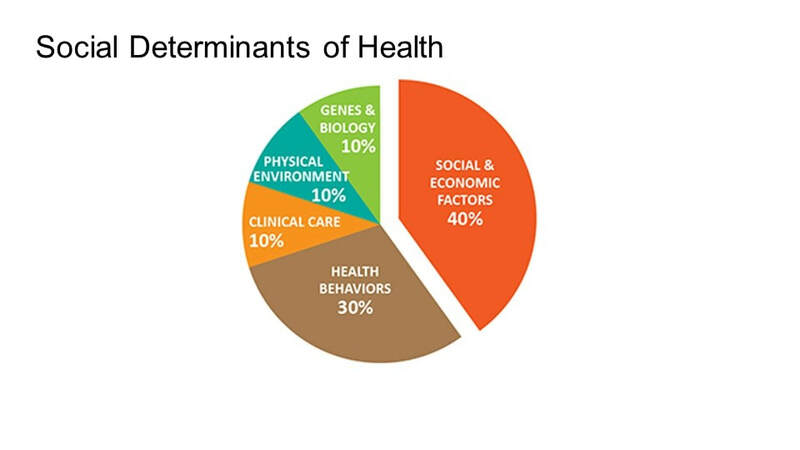 The problem with the graphic by Stanford Medicine WellMD is that it makes it look like we should put 33% of our resources into each bucket. 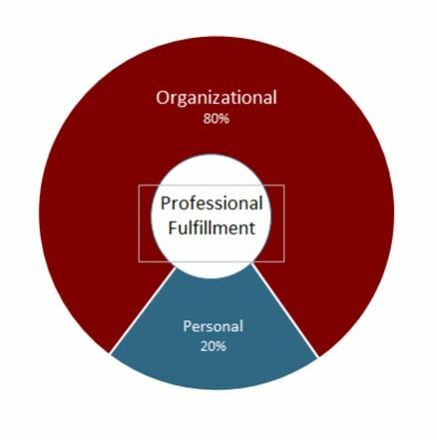 The fact is that up until 2017 or so, most organizations in healthcare trying to do something were probably putting 80% of their effort into shoring up individual resilience, mindfulness, and work-life balance in physicians. ​It begs the comparison to the World Health Organization's Social Determinants of Health model, which proposes that access to health care is just 10% of the factors related to health: important, but not as critical as the social and economic factors that people live in. 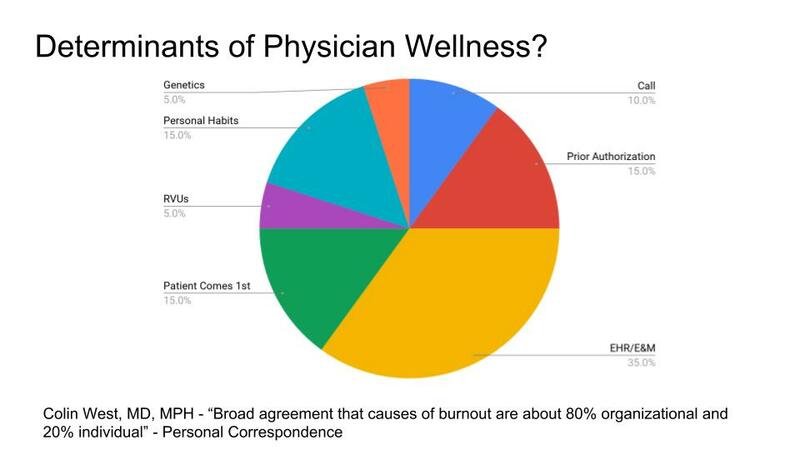 Similarly, we might imagine a pie chart depicting the Determinants of Physician Health and guess at various organizational and medical cultural factors that might apply.